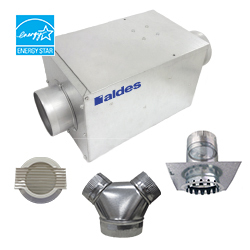 American Aldes SBFK Single-Port Bath Fan Kits are a flexible way to install a compact exhaust grille directly over the shower or in tight bathroom spaces. The powerful central system effectively removes moisture, steam, and odors right from the source. The SBFK is designed for homes with 1-2 bathrooms. It includes an efficient, in-line ENERGY STAR rated fan, 4″ Deco grilles, a wye, and universal mounting sleeves with backdraft dampers.